Rusty Bucket Restaurant and Tavern will hold its annual coat drive Nov. 5, 2018 through Feb. 1, 2019. All guests are encouraged to donate new and/or gently used coats of all sizes which will be donated to the Salvation Army and distributed to those in need this winter season. 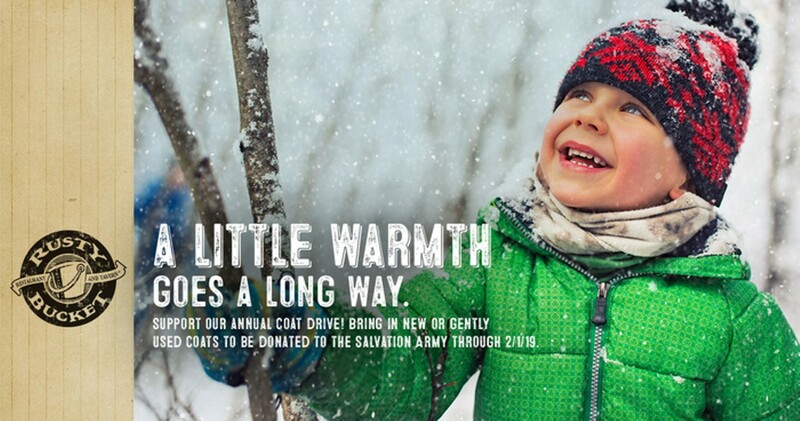 A total of 8,669 coats have been donated since the coat drive began in 2011. Collection boxes are located in all four metro Detroit Rusty Bucket locations: 30450 Telegraph Rd., Bingham Farms; 42874 Woodward Ave., Bloomfield Hills; 18785 Traditions Dr., Northville and 15400 Sheldon Rd., Northville.